So far I have posted on MongoDB deployments either as standalone or as part of a replica set. 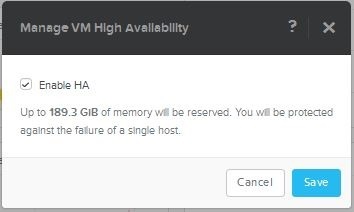 This is fine when you can size your VM memory to hold the entire database working set. However, if your VM’s RAM will not accommodate the working set in memory, you will need to shard to aggregate RAM from multiple replica sets and form a MongoDB cluster. - the above IP addresses in mongos command line are the addresses of each config DB. This brings up an issue if you are not cloning replica VMs from “blank” gold VMs. By cloning a new replica set from a current working replica set, ie: so that you essentially have each replica set holding a full copy of all your databases and their collections. Then when you come to add such a replica set as a shard, you generate the error condition shown below. We next need to enable sharding on the database and subsequently shard on the collection we want to distribute across the replica sets available. The choice of shard key is crucial to future MongoDB cluster performance. Issues such as read and write scaling, cardinality etc are covered here. For my test cluster I am using the _id field for demonstration purposes. This entry was posted in Acropolis, MongoDB, NoSQL, XCP and tagged Acropolis, AHV, AOS, availability, balancer, chunks, clone, cluster, collection, configdb, database, gold image, HA, mongod, MongoDB, mongos, partitioned, Prism, replica, replica set, shard, workingset on 9th October 2015 by Ray Hassan. 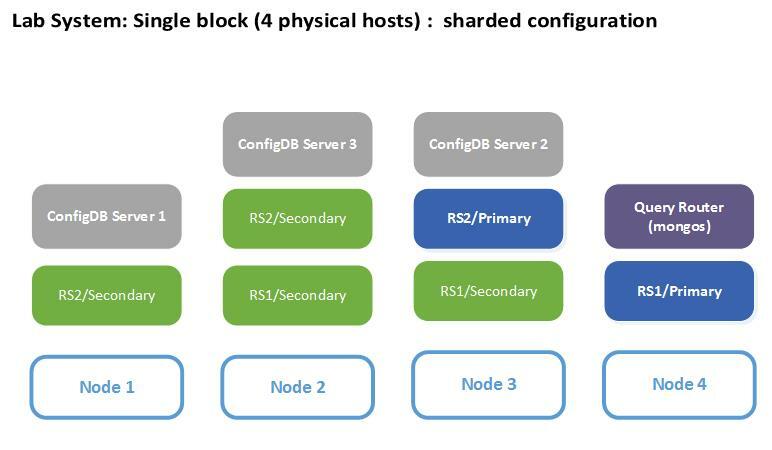 In this post I am going to look at setting up a replica set to support high availability in a MongoDB environment. Replica sets contain a primary MongoDB database and a number of additional secondary replica databases. Any one of the allowed replicas can become primary in the event that the original primary fails for whatever reason. Replica set membership count is usually an odd number in order that new primary elections are not tied. 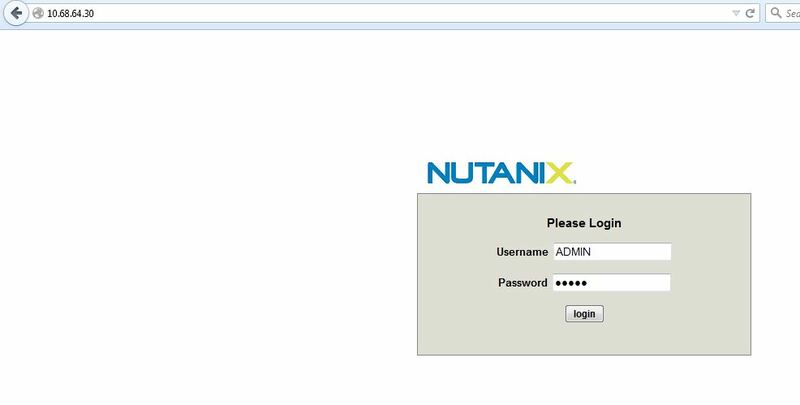 Building out an HA MongoDB setup on Nutanix is relatively easy to do. Each MongoDB instance is hosted in a separate, sandboxed environment. In our case a virtual machine (VM). Each VM is then located on a separate physical hypervisor host. I have a gold image VM that has a MongoDB instance installed along recommended best practice guidelines. This VM gets cloned as required when I need to build out a new MongoDB environment. So for a 3 member replica set I need 3 clones. After powering on the VMs, check that mongod starts correctly on default port 27017 on each VM. First thing to make sure is that the mongod process is listening on the correct address. I have set my VMs to use DHCP and this is the address that the service needs to listen on. abridged iptables -L output after the above changes…. Should any of the connection tests fail then revisit the iptables entries. Usual troubleshooting applies with telnet or nc, netstat etc. Ensure that the firewall rules allow proper access between the VM’s. From the output above we can see the full replica set membership, both the member function and status. Things like priority settings and whether or not the replica is hidden to user applications queries etc. Also, whether a replica is a full mongod instance or an arbiter (simply there to mitigate against primary election ties). Or, if any of the replicas have a delay enabled (used for backup/reporting duties). In an earlier post I have shown the available mongo shell commands to calculate the working set for the database. For read intensive workloads, where your working set is sized to fit available RAM in the mongod server VMs; a replica set deployment can be used to run MongoDB and support high availability. This entry was posted in Acropolis, MongoDB, NoSQL, XCP and tagged 27017, Acropolis, AOS, arbiter, availability, clone, firewall, HA, hidden, iptables, mongod, MongoDB, NoSQL, primary, replica, replica set, secondary, virtual machine on 7th September 2015 by Ray Hassan. One way of demonstrating the concept of ‘Invisible Infrastructure’ is the ability to complete a full system upgrade with minimal service interruption. 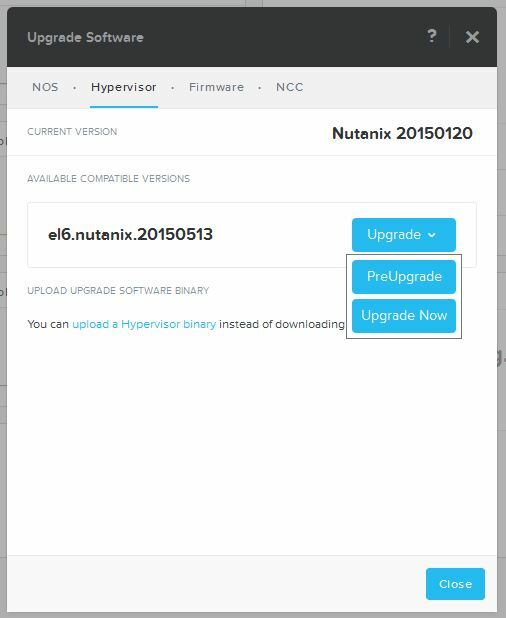 In this post I will show the “One Click” upgrade facility that’s available on the Nutanix platform. 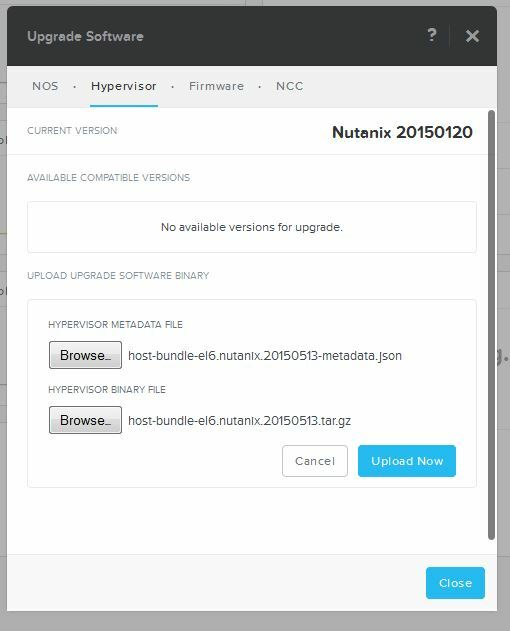 This facility allows the admin to upgrade the Nutanix Operating System (NOS), the hypervisor, any required storage firmware and appropriate version of Nutanix Cluster Check (NCC) for the target NOS release. 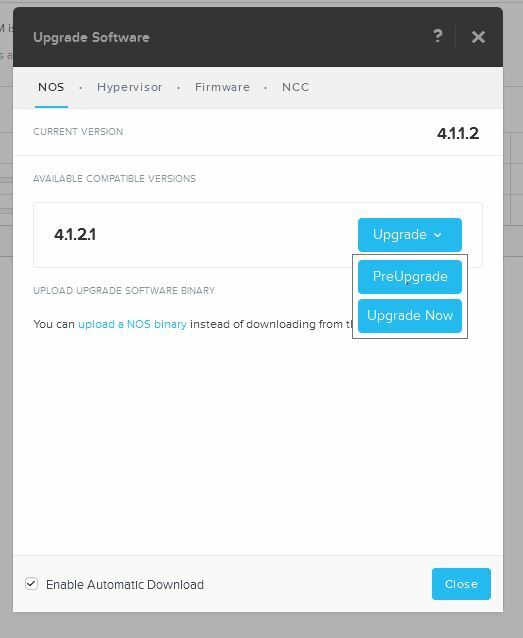 You can choose to either upload the NOS upgrade tarball or have it automatically downloaded to a landing area. Just check the Enable Automatic Download box. Here I am uploading the software to the platform. 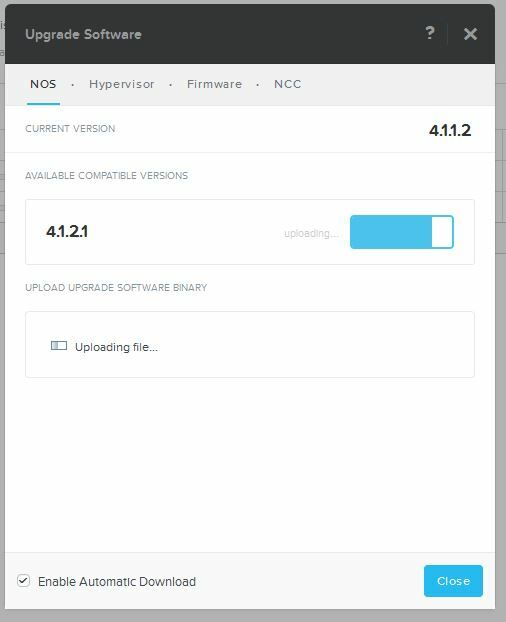 Similar to the NOS version, the hypervisor can also be upgraded to a newer version when available. You can either select to run the preupgrade checks standalone without performing an upgrade or just select to upgrade directly, those same checks will be run before the start of the upgrade in any case. Selecting upgrade will show the progress of the various stages of the upgrade as they occur. CVMs are upgraded sequentially and only one CVM is rebooted at a time. A CVM is always back in the cluster membership before the next CVM is restarted. 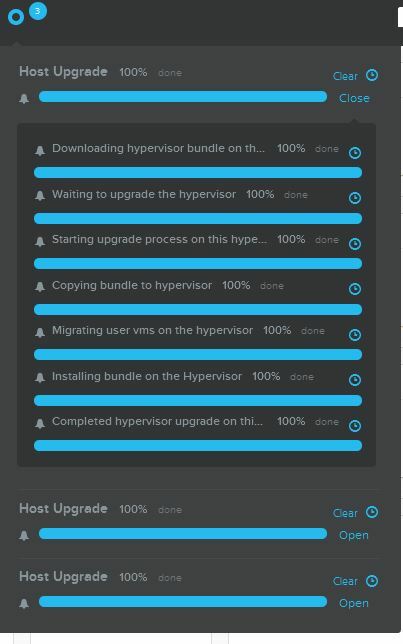 You can choose to upgrade the underlying hypervisor as well at this stage. As always you can check progress in the Prism main window. Here we see the upgrade process has completed successfully. 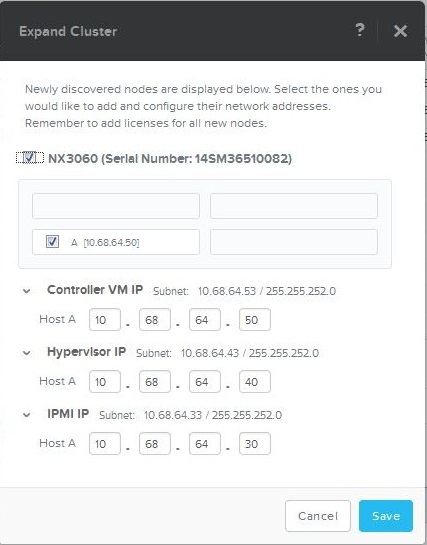 Nutanix Prism also shows the individual task info ie task stage, CVM/host involved, time taken etc. 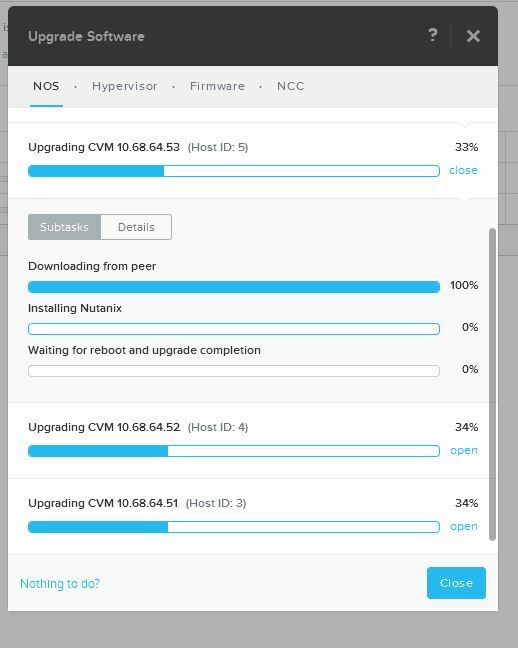 The Nutanix platform upgrade takes care of all the intermediate steps and just works, regardless of the size of the cluster. There’s minimal impact and disruption as the upgrade takes place and it enables you to carry out such tasks within normal working hours, and not losing a weekend to the usual rigours of a traditional hardware upgrade cycle. This entry was posted in Acropolis, XCP and tagged Acropolis, Acropolis Base OS, AOS, cluster, CVM, DevOps, EOU, Invisible Infrastructure, NOS, Prism, Upgrade on 21st June 2015 by Ray Hassan. 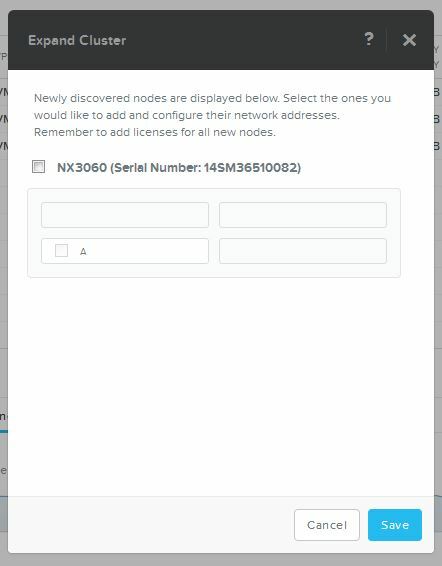 After inserting the new node into the chassis slot, connect to the nodes lights out management or IPMI webapp via a browser (enter the IPMI address) and login using the ADMIN credentials. You may need enable Java in your browser and configure Java to allow the IPMI address. 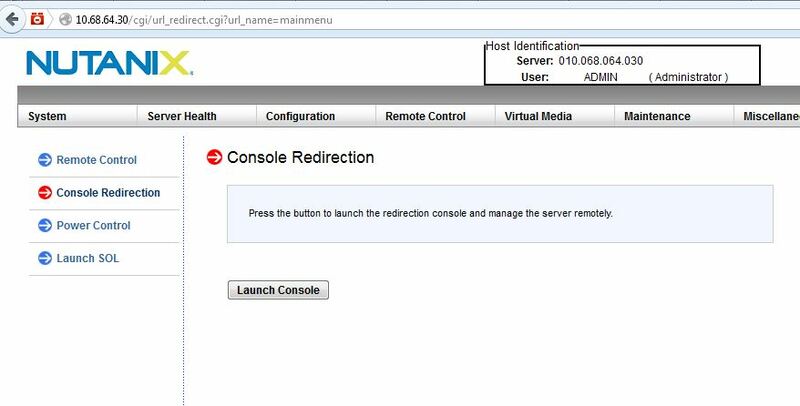 Launch the Console to enable remote access the Hypervisor. Using the ‘Power Control’ drop down on the Menu bar across the top of the frame- Power On the node (if needed). You can at this point set up any L2 networking such vlan tagging etc. Select ‘Expand Cluster’ from the right drop down menus in the Prism GUI. The node should be auto-discovered. 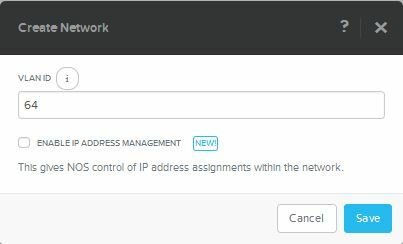 Configure the required network addresses and select ‘Save’ to add the node to the cluster. The progress of the node addition can be monitored in the Prism GUI. 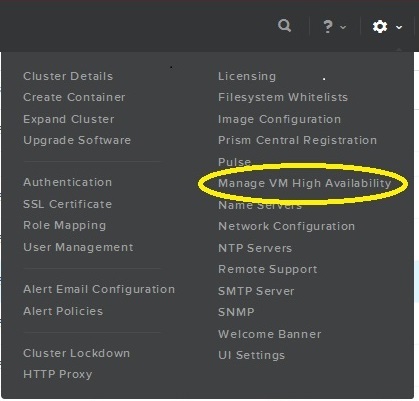 Note that the hypervisor was automatically upgraded in order to maintain the same software functionality across the cluster nodes. 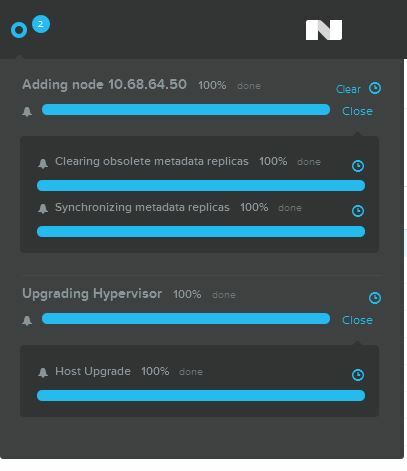 That’s it, once the node is added and the metadata is re-balanced across all the nodes, then the new nodes storage (HDD/SSD) is added to the storage pool with the rest of the cluster nodes. At which point all containers (datastores) are automatically mounted onto the newly added host and the new host is ready to receive guests! This kind of ease of use story is becoming paramount in terms of time to value for many webscale applications. Its all well and good having applications on top of NoSQL DBs that allow for rapid development and deployment. However, if the upfront planning for the underlying architecture holds everything back for days if not weeks, then modern DevOps style operations are much harder to achieve.. 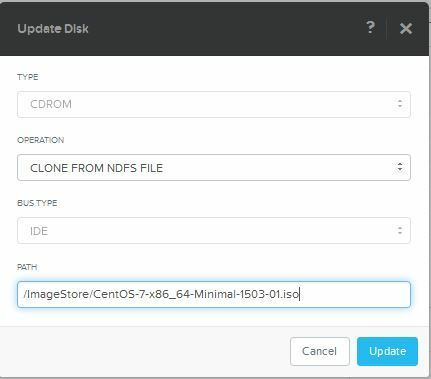 This entry was posted in Acropolis, XCP and tagged Acropolis, AOS, Cloud, cluster, DevOps, EOU, expand, Orchestration, Prism, Provisioning, Upgrade on 10th June 2015 by Ray Hassan. QEMU (Quick Emulator). 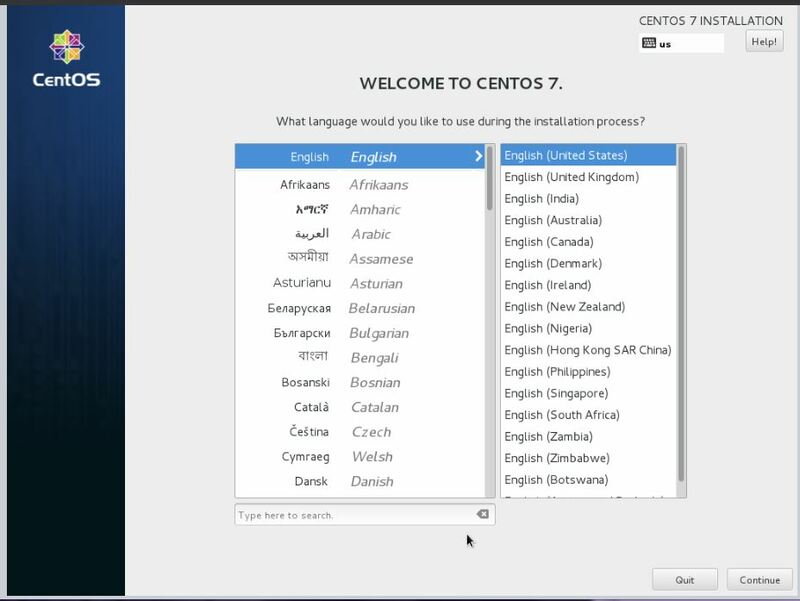 An emulator and virtualizer for Linux. KVM leverages QEMU specifically for CPU emulation, executing virtual machine operations directly on the host CPU to achieve near native performance. KVM kernel modules: Loadable kernel components which provide the virtualization infrastructure (other than the CPU). Specifically, kvm.ko provides the core virtualization infrastructure and a processor-specific module (kvm-intel.ko or kvm-amd.ko) interacts with QEMU. 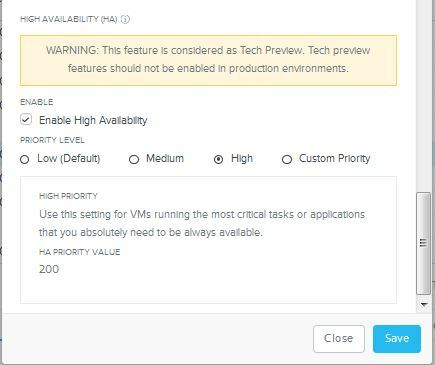 Next select +VM Create and fill out the details as required above. We will add a NIC, a boot Disk and attach the CDROM image in the next steps. 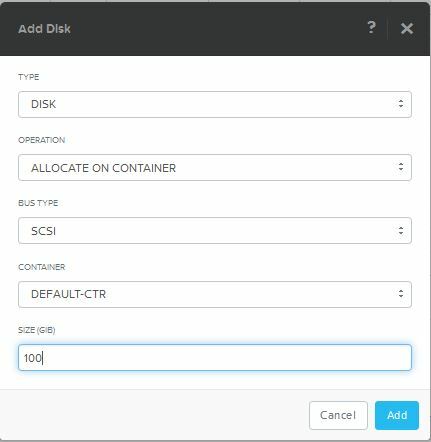 Add Disk – create a 100GB vDisk to act as the permanent boot disk stored on DEFAULT-CTR. Power the VM and launch the console from the Prism GUI. The VM should power on and install. These images can of course be managed by utilities such as virt-manager, virt-viewer, etc. Equally, I have not shown the full complexity of the command line options, exposed by the standard KVM APIs. I have shown though, how the Nutanix software simplifies and abstracts away the complexity of these APIs that most provisioning and orchestration stacks have to deal with. 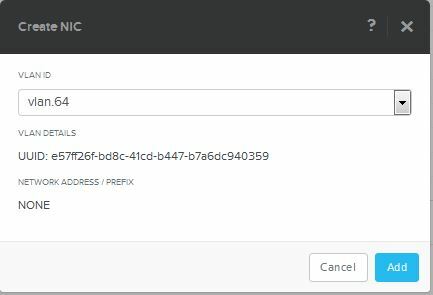 The Nutanix platform does provide a management API and a command line syntax to build out your VMs but I will leave that for another post in the future. Thanks for reading. 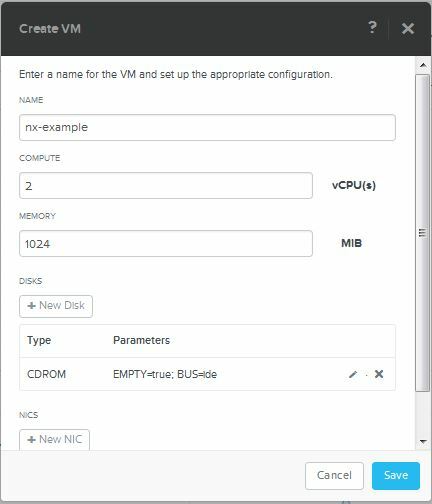 This entry was posted in Acropolis, KVM, XCP and tagged AOS, API, CentOS, KVM, libvirt, Prism, QEMU on 8th June 2015 by Ray Hassan.